Description: This book is only six pages long, and they're not even pages, they're thick pieces of smooth cardboard in the shape of a book. 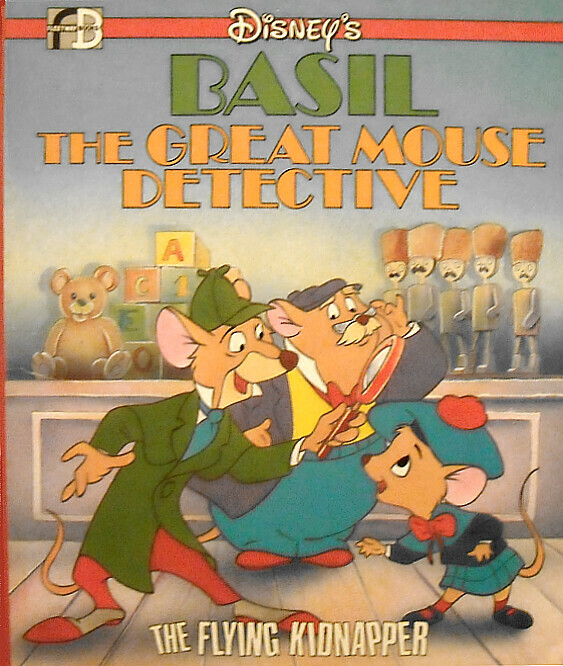 The story opens with Basil searching for Olivia's Daddy and starts with the three searching in the human toyshop. Fidget (spelled Fidgit in this story) jumps out of the baby's 'cot' and snatches up Olivia in the bag, escaping through the sky light. Basil and Dawson find the shopping list and use it to track him down. Several hours later, Basil and Dawson catch the kidnapper and restore Olivia to her Daddy. And that's it! There is no mention of Ratigan at all, nor is there anything about the assassination attempt on the Queen. This could be best described as a five-minute cartoon short, like a Disney Silly Symphony, far from a full-length feature film! Where can it be purchased: The book is scarcely found online at Amazon.com, eBay, and Alibris.